Ben Z Noodle House (map, 536 Seymour St, Vancouver, BC, Canada, phone: 604-688-8385) offers tasty Vietnamese cuisine such as Pho noodle soup, spring rolls, salad rolls, curry, and meat skewers. It’s located in downtown Vancouver within walking distance of Canada Place, the Pan Pacific Hotel, and Vancouver ‘s cruise ship terminal. It’s also close to the Granville Street Skytrain station and the Four Seasons Hotel. The restaurant’s menu has lots of pictures, making ordering easy even for those who are not so familiar with Vietnamese cuisine. The atmosphere is casual and the service is quite efficient. Prices are reasonable with most dishes under $10. See Part 1 for more photos and info. 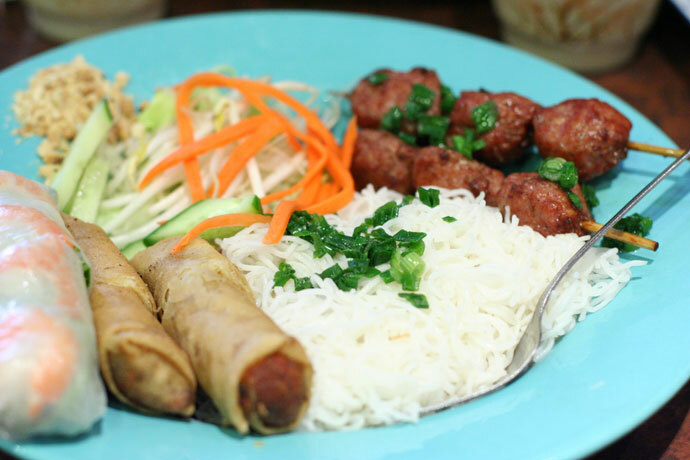 Combo A (around $9.95) – Vietnamese Spring Rolls and Salad Roll, Vermicelli noodles, and Vietnamese BBQ meat balls. Vana Vietnamese Cuisine is a fast food vendor at the Tinseltown mall (view map, address: 88 W Pender, Vancouver, BC, Canada, phone: 604-806-0799), on the level below the movie theatres (which, incidentally have discounted movies on Tuesdays, for $8.75 a ticket). The food court is cash only, but some great deals can be had here, including the Vietnamese crepes with salad (pictured below, around $5.50). There is also an excellent Korean/Chinese fusion full-service sit-down restaurant in the mall called Wild Ginger (click here for review). For more info on the mall’s location and food court, please visit my previous review (click here). It’s located really close to GM Place Stadium, the Stadium skytrain station, and BC Place Stadium downtown, on the border between the main downtown area and Chinatown / downtown east side. Ben.z Noodle Restaurant (536 Seymour Street, 604-688-8385) is a recently opened Vietnamese restaurant that is within walking distance of the Waterfront skytrain station, Canada Place convention center and cruise ship terminal downtown. The menu is very friendly even to newcomers to this delicious cuisine, with only a few main choices and lots of pictures. 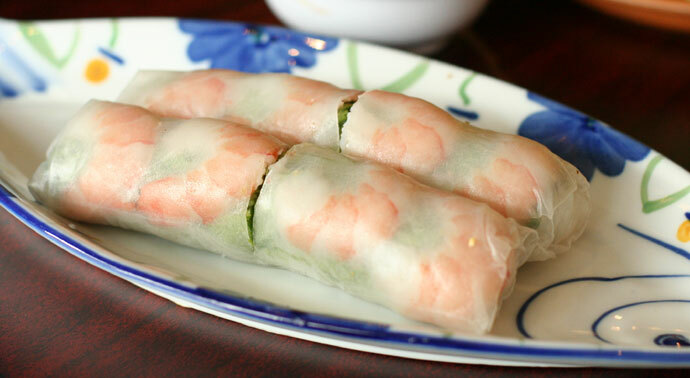 The Vietnamese Salad Rolls ($5.25, pictured below) are one of my favorite items: prawns, vermicelli noodles, and vegetables are wrapped in a delicate rice wrapper, served cold with peanut dipping sauce. 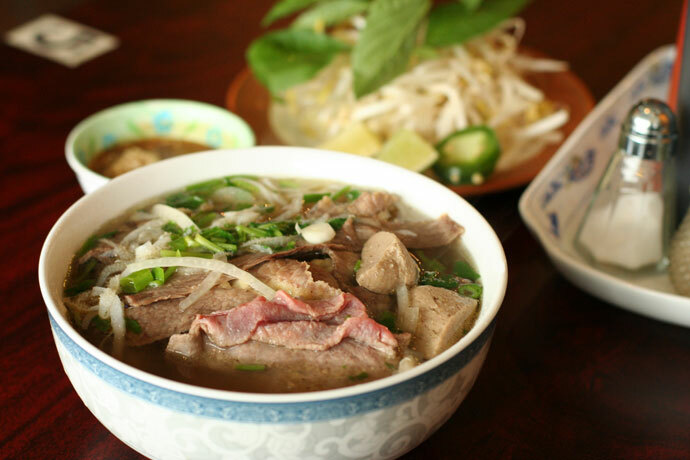 The beef pho soup (reasonably priced at $7.75, also pictured below) is a huge bowl filled with various kinds of meats and noodles in a steaming broth. This is comfort food at its best and is perfect for a rainy Vancouver day. 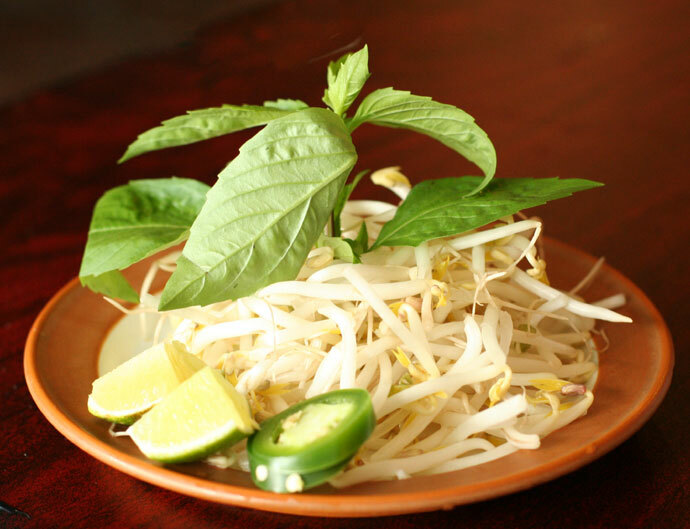 The soup is served with a side plate of bean sprouts, fresh herbs, hot peppers, and a couple slices of lime (also pictured below). View More Restaurants in the Vietnamese category. 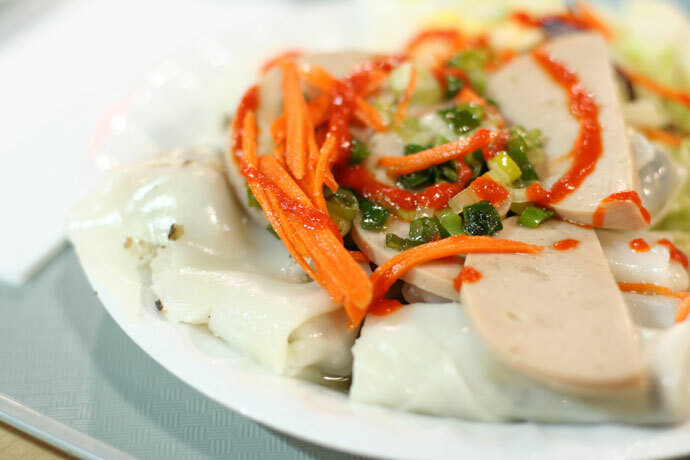 We hope you enjoy the great Vietnamese restaurants on Dine Out Here Vancouver.